Treat hormonal acne from the inside out! If you’re struggling with hormonal acne, you are not alone! I’ve cannot tell you how many times I’ve tried to figure out what causes hormonal acne, and how I can control mine. 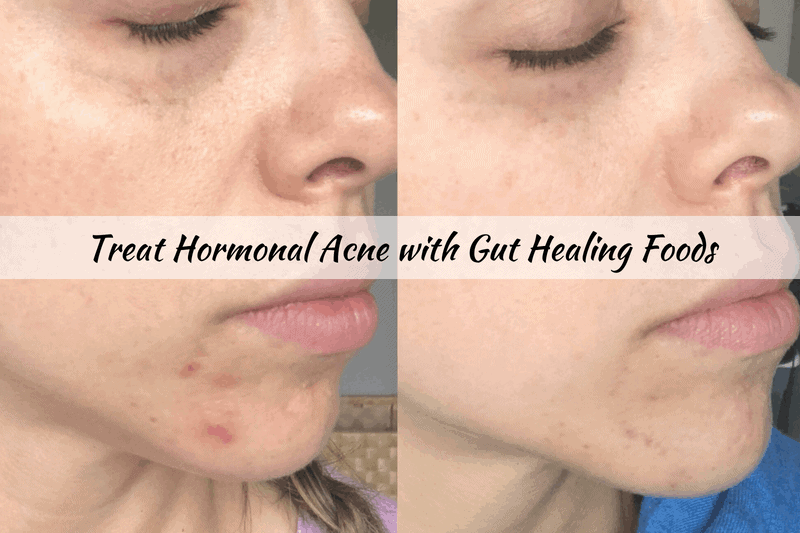 This blog post will help you to begin to research if gut healing foods could be the answer to your hormonal acne problems! Disclaimer: The information contained here is for informational purposes only. This information is not intended to be medical advice and is solely based on my own experience to use vitamins for my personal health. I am not a licensed psychologist, nutritionist, physical trainer, or health care professional. All readers should consult with their healthcare professional before starting any nutrition, wellness or exercise program. I’ve had hormonal acne off and on since I had my first daughter. I think that the hormone changes after pregnancy and with nursing just made my body go haywire. Furthermore, I had never had a super regular cycle. For the past year, my skin went from breakout to breakout. It seemed as soon as one would heal, another would pop up. Things got a little crazy at the beginning of this summer. My skin went crazy! Like completely crazy. Breakout upon breakout and it was just getting worse. I kept trying product after product, but something was telling me this had more to do with an internal issue. I did my own research which I suggest anyone do before trying a new regimen. I’ve seen my dermatologist on an annual basis, but gut health was never discussed. So I started researching. When I realized that there was a link between gut health (leaky gut) and hormones (not to mention anxiety and other stress I was feeling) I knew it was time for me to take control! Note – these photos are completely unedited. I’m shocked to see the change, honestly! 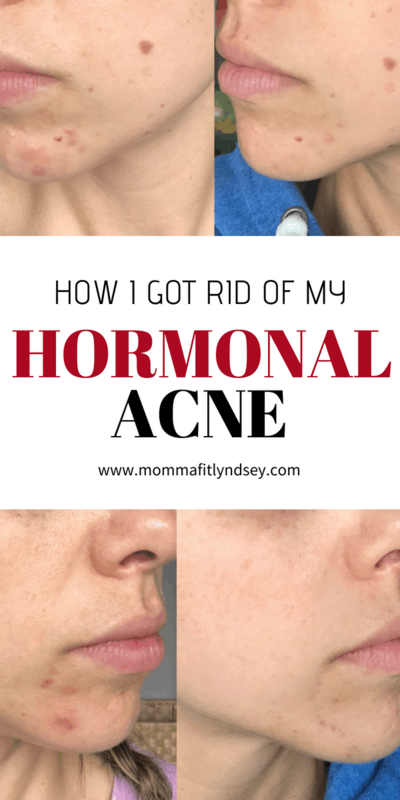 Keep Reading to see what I did to treat hormonal acne! Leaky gut is a condition caused by stress which leads to hormonal imbalance. Inflammatory foods like those containing gluten are believed to further complicate leaky gut syndrome. Leaky gut can lead to bigger problems beyond acne such as autoimmune disease. If you are experiencing symptoms of leaky gut such as frequent colds, food sensitivities, thyroid issues, digestive issues, adrenal fatigue, joint pain, depression or anxiety then you will definitely want to talk to your healthcare provider about a treatment plan. For me, all of the over-the-counter products in the world could not help me control my chin acne. 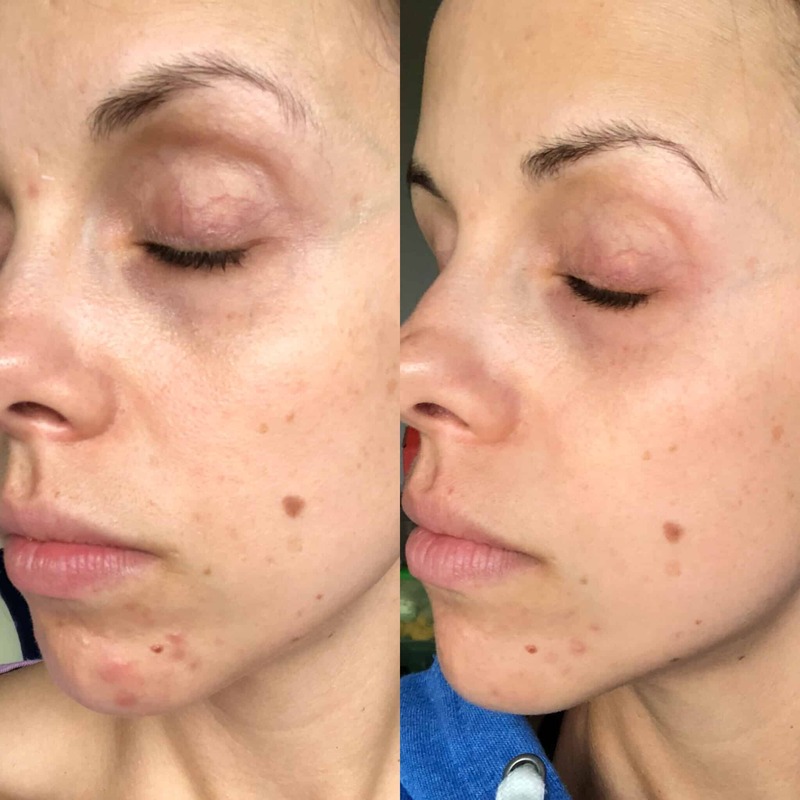 My flare-ups hit an all-time high about two months ago and I knew it was time to research what causes chin acne and how to get rid of it! After researching and finding that there is a direct link between gut health and hormonal imbalance, I decided to work on healing leaky gut. Not only did I dial in my nutrition and focus on eating clean 90% of the time, but I also decided to focus on taking probiotics and focus on eating gut healing foods. The best gut healing foods are those rich in prebiotics and probiotics. Taking probiotics as a supplement is a great way to get extra gut healing power! But there are also a bunch of gut healing foods that have prebiotics and probiotics in them. 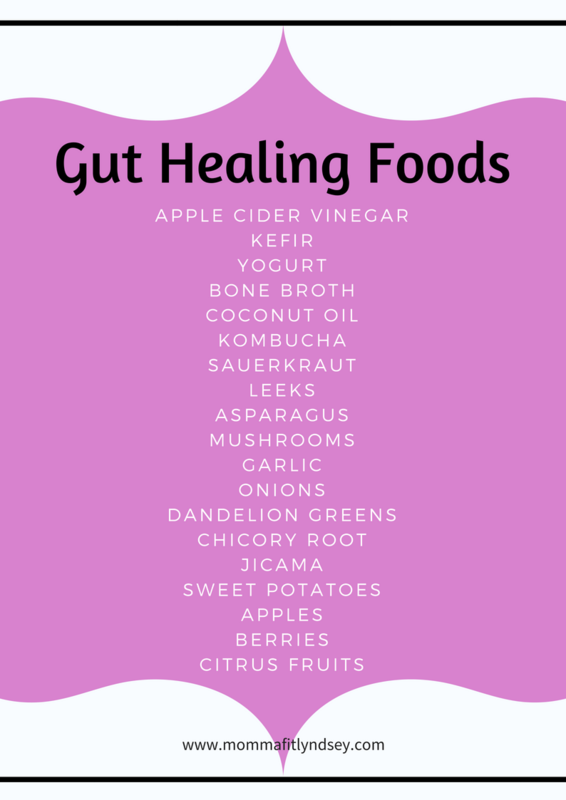 Download your list of gut-healing foods here! Step 1 was to clean up my diet. My nutrition took a bit of a hit over the holidays (as I’m sure it does with most people!). But when I started half marathon training, I allowed more treats then I would normally do. My super squeaky clean diet needed a tune up. Step 2 was adding in the right types of gut healing foods that would help to treat hormonal acne for me! Every person is different so some foods may work for me that may not work as well for you. I experimented until I found the ones that worked. Step 3 was finding the right products for my skin. I needed gentle products that exfoliated. I still have a bit of scarring and under the skin issues that I need to work out. Once I have products for those, I will be sure to share them! 2 – Take Vital Proteins everyday. 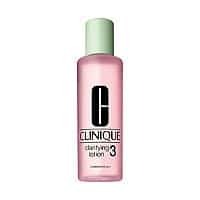 3 – Use gentle skincare products and exfoliate daily. Keep reading to see the products I use! 4 – Take turmeric pills daily. Turmeric is believed to reduce inflammation. 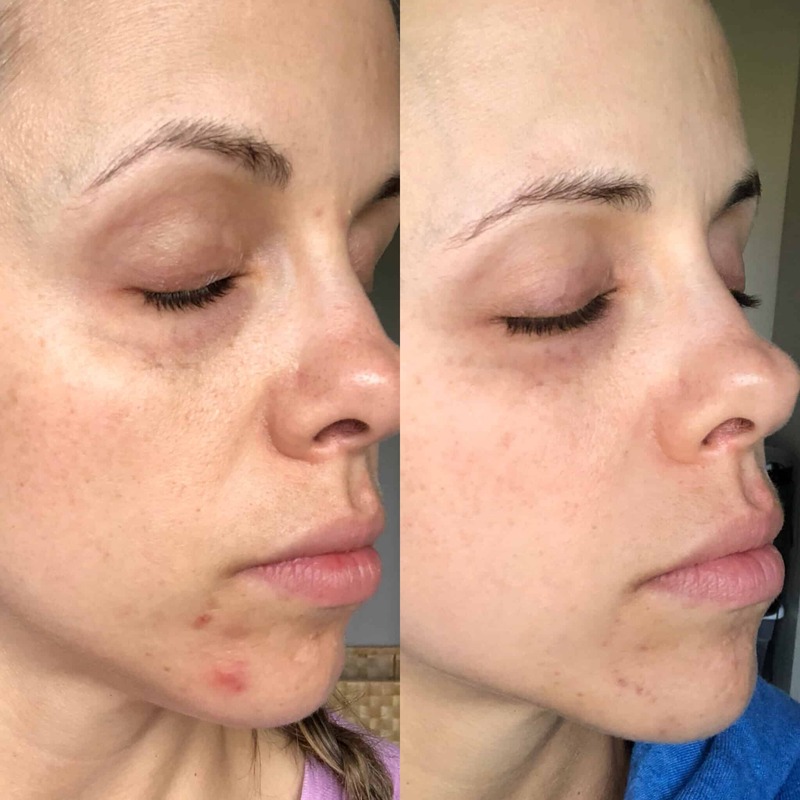 My top Product Recommendations to Treat Hormonal Acne – Shop this Post! I received a ton of feedback over on Instagram about the different products that worked topically to treat hormonal acne. There are SO many amazing products out there! Sometimes trial and error will help you figure out what will work for you. For me, I knew if I wanted to get rid of my chin acne I needed to heal my gut. I have found a few topical products that work, but it’s the gut healing foods and supplements that I believe have helped me to start to clear up! 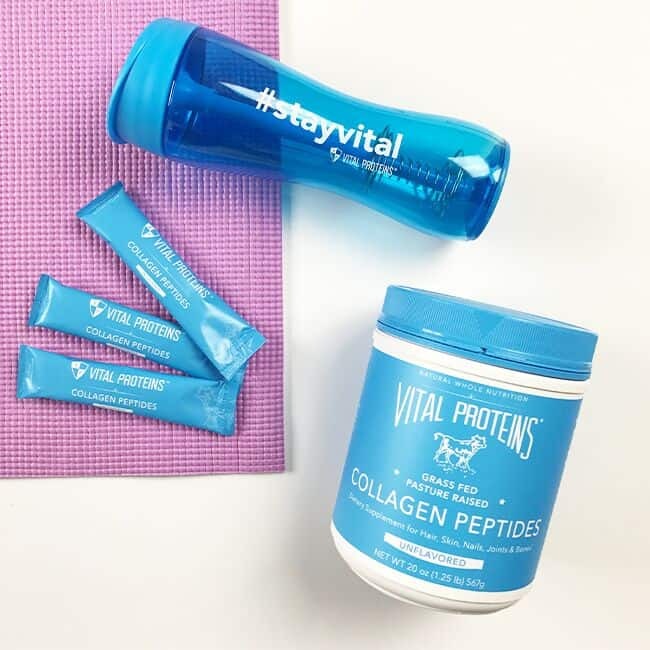 Daily I take Vital Proteins Collagen Peptides in either my shake or right into my hot tea. They dissolve quickly and have no taste. You seriously don’t even know they are in your drink! I have found that exfoliation and gentle cleansing works the best for me regarding products for hormonal acne. I use this gentle facial cleanser twice per day. I use at night on under-the-skin blemishes that haven’t yet come to the surface. I use on larger zits that are above the surface. I use once per day. I use twice per day. Postpartum Weightloss Journey – How I lost the baby weight! Alright friends, how is your gut health? Do you struggle with hormonal acne or gut health? Tell me about it in the comments! Join 20,312 other followers and subscribers in getting more healthy family lifestyle tips & recipes right to your inbox! Download your FREE gut healing foods list here!